A Gantt Chart is a visual representation of projects tasks against a timeline. 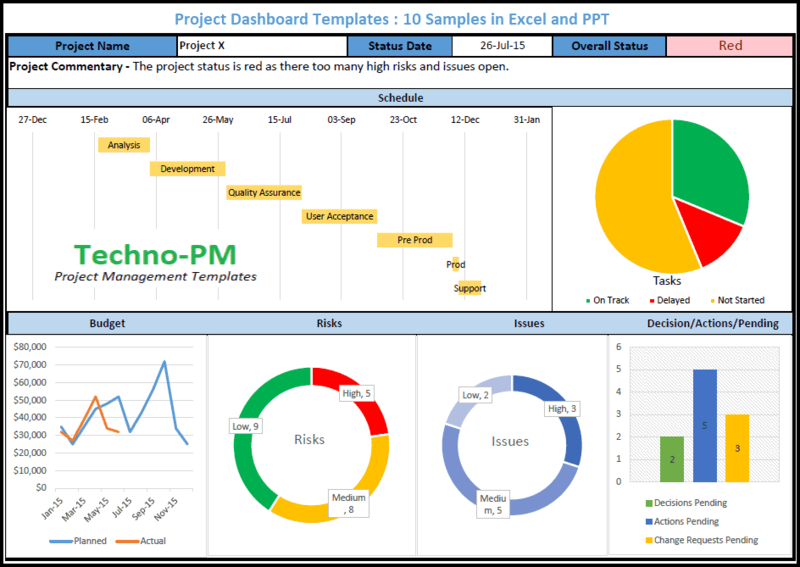 Microsoft Excel Gantt Chart allows a project manager to visualize different stages in a project and how the phases or tasks are planned against a timeline. A Gantt Chart could be a simple task vs time representation or a complex representation which shows tasks, resources, dependencies and critical path of the project. The chart was invented by Henry Gantt and is named in his honor (Gantt isn’t an acronym). The Excel Gantt chart template allows users to enter the start date of the view. The timeline for the Gantt chart can be adjusted. You can view the timeline for 1, 2 or 5 days or even more. Typically, when planning you need a detailed view but once planning is complete you need a holistic view. Allows use of predecessors for tasks - this features allows you to capture task dependencies. Auto calculates end dates for tasks based on start date and effort. Tasks are highlighted when they are not 100% complete beyond the current dates. Highlights the current date on the Gantt Chart this provides a view from reference from the current date. The Gantt Chart Excel template also handles holidays. You can enter the list of holidays in a separate tab. So when a date is entered as a holiday that day is not used when the task finish is calculated. When creating a task always copy-paste the existing tasks so that the conditional formatting also gets copied to the new task. 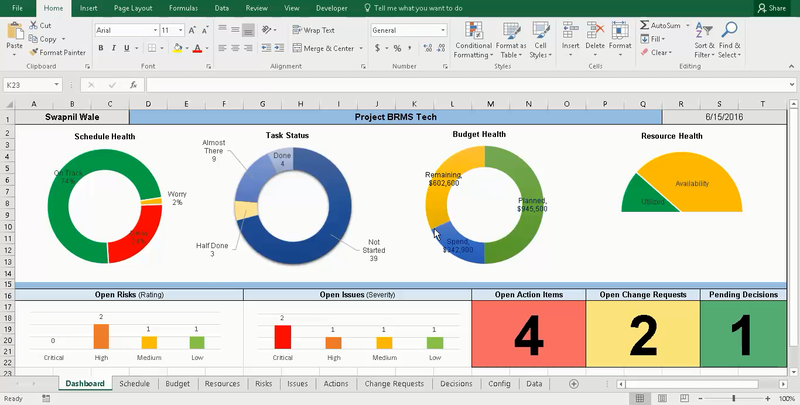 You can change the color of the Gantt by changing the conditional formatting options. Advantages - Provide an easy and natural way of viewing the project time frame of project tasks against a background of time with dependencies clearly highlighted. Very effective in finding out the delivery timeline for a project. A Gantt chart will have a task, duration, start date and end date for the task and predecessors/dependencies. Using them a project manager can clearly articulate the task dependencies and the how they play a role in the timeline of the project. Viewing the critical path for the projects provides the task that should be given priority is something again driven by Gantt Charts. They clarify the resource workload. Can be very effective in showing a high-level view of the project phases. Can help with project tracking. Disadvantages - A lot of different varieties of chart are used which can confuse people (an example is above). Not suitable for high-level management as can get very detailed. Tools often lack the functionality to view and print large Gantt charts. Often need to be supplemented with additional data or tables for task information. Always include task dependencies and predecessors in the project plans. Ensure that you consider account for holidays and major leave plans. Using different colors for different phases can make the Gantt Chart more readable. If the plan is a tool complex add high-level project phases of tasks. Mention the key milestones or tasks in the plan as separate tasks. 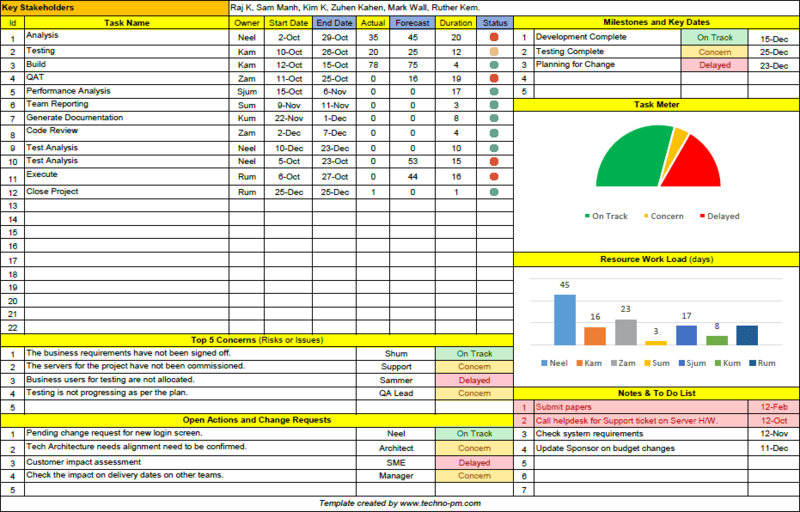 Document the tasks in chunks of slots of up to 5 days as making them more granular can make the chart unreadable. Always store the previous copies of the updates for comparison. It’s a good idea to store the copy with a date prefix (Gantt_Plan_12-Feb-2016.xlsx). Before publishing the final version it’s good to get peer reviews and/or do a dry run with your manager. When publishing check to ensure all the readers have the tool or you can publish using a PDF format. Always include some amount of contingency in the tasks which have cross-dependency.